Summary and Definition: The term "Dollar Diplomacy" refers to the use of diplomacy to promote the United States commercial interest and economic power abroad by guaranteeing loans made to strategically important foreign countries. The Dollar Diplomacy (1909 - 1913) is primarily associated with the administration and the foreign policy of Secretary of State Philander C. Knox and President William Taft - hence the well-known phrase 'Taft's Dollar Diplomacy'. Taft and Knox used 'Dollar Diplomacy' in several countries in central America including the Dominican Republic, Nicaragua, Guatemala, and Colombia. 'Dollar Diplomacy' was also used to aid the stability of Caribbean countries such as in Honduras and Haiti. By using Dollar Diplomacy Taft attempted to extend the American sphere of influence in China and also to Liberia in West Africa. 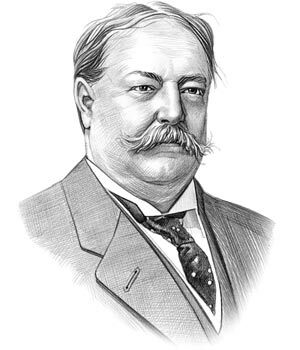 William Taft was the 27th American President who served in office from March 4, 1909 to March 4, 1913. One of the important events during his presidency was Taft's Dollar Diplomacy. ● The United States had to send troops to protect American investments. The article on the Dollar Diplomacy provides detailed facts and a summary of one of the important events during his presidential term in office. The following William Taft video will give you additional important facts and dates about the political events experienced by the 27th American President whose presidency spanned from March 4, 1909 to March 4, 1913.